I have to admit, it’s been a long time since I sat down and listened to a Prong album – although a couple of decades ago Force Fed was very rarely away from my turntable. And I’m not the only one to have had a bit of a hiatus from the band, as reading through the recent bio it seems like frontman Tommy Victor has spent the best part of the last decade or so as a jobbing musician working with a variety of people (in between various incarnations of Prong) including Danzig and Ministry. I have to say, the break has done both of us the world of good – as Carved Into Stone is by far the best metal album I’ve heard so far in 2012. In fact I was so impressed with the album after my first couple of listens that I decided to wait another three weeks before writing my review, just to let its qualities percolate in my head a while longer. After all, Prong are almost renowned as an ‘also ran’ band – one that promised much, but never quite lived up to their initial strength. But three weeks on, and this album has now become a part of me. Not only are the riffs huge and hugely addictive, but the vocal melodies and choruses are equally epic and catchy as hell. This is the sound of a totally revitalised force, a three-piece who know what they want to do and how to do it. 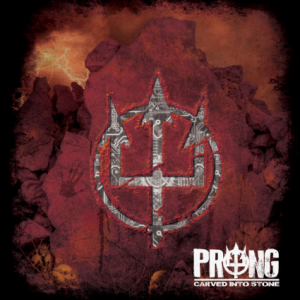 Victor has brought certain elements along with him from his extra-curricular activities – without sacrificing the very core of what made Prong special in the first place. ‘Eternal Heat’ rips out of the speakers with the ferocity of a caged tiger set loose, before settling into a fast-paced thrash chug – but it’s on ‘Keep On Living in Pain’ that the true nature of the album is unveiled. This isn’t just a one-dimensional metal dirge, this is a fully-formed well-developed metal anthem, and it’s not alone – this album is full of them. ‘Revenge_Served Cold’, like a lot of the tracks on the album, has a real post-90s-era Killing Joke sound to it (of course, the late KJ bassist Paul Raven is another ex-Prong member) – in fact, Tommy even seems to be adopting certain Jaz’isms with his vocal delivery, and it really suits him. Other highlights (on an album full of highlights) include ‘Put Myself To Sleep’ (which has one of those ear-worm choruses that will keep you awake at night), the simply superb title track ‘Carved Into Stone’, and ‘Path of Least Resistance’ which evokes memories of The God Machine (that criminally overlooked three-piece from the early 90s). I honestly cannot express what a strong album this is. It’s up there with your Mastodons and the other lauded new kids on the block – and the fact that it’s been produced by a band celebrating their 26th year is a really wonderful thing. 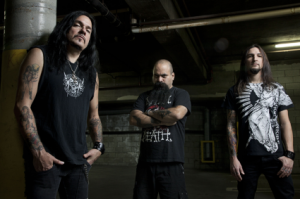 Prong are back, and they are finally delivering on a long-held promise. It’s time for them to step out of the shadows and stand at the front where they belong. Cannot wait to hear it ! OMG ! I can’t wait to hear this record. I’ve heard 30 clips of each track on SPV Record’s website and I liked what I heard.